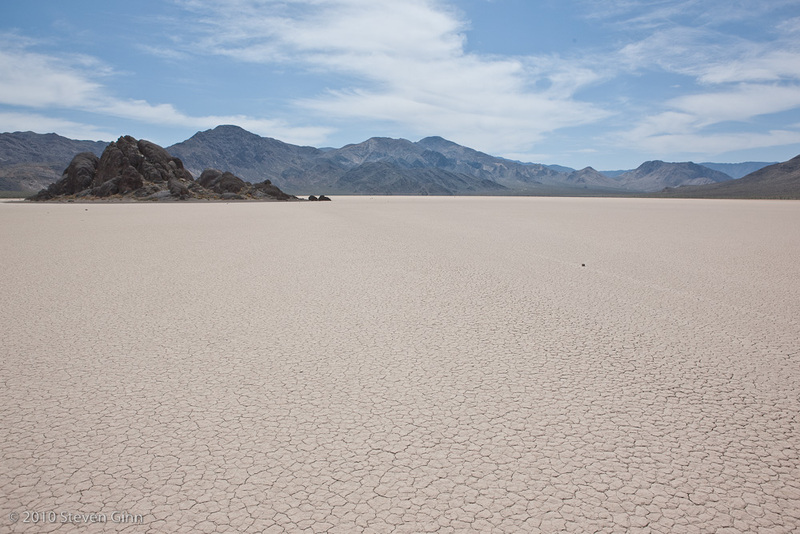 One of the key places I had wanted to visit on this trip was the Racetrack Playa. Today is the day we drove out there. From Furnace Creek it was a long drive there. The first part was a long drive on pavement, with several construction stops and pilot cars to make it through the many re-paving activities that are going on this summer in Death Valley. At one point we were concerned that we might not be able to make it because to get to the turnoff for the Racetrack you have to first drive to Ubehebe Crater. But when we reached the turn off for Ubehebe Crater it was closed for paving. There were a bunch of large asphalt trucks at the turn off and a guy directing them. So I parked the car and got out and talked with him and he told me to pull up to a spot where one other car was already waiting and they would get us out to the Racetrack road. This person also volunteered the information that a lot of folks have been getting flat tires this year on the Racetrack road. After a while a pilot car showed up and took us and the other car to the Racetrack turnoff. The other car stopped at this junction and appeared to be hiking the rest of the way up the closed road up to see Ubehebe Crater. At this point it was 27 miles to the Racetrack Playa on a sometimes rough and sometimes ok rock road, but most of the road seemed to have sharp rocks looming everywhere ready to shred our tires. The result was that I did the drive at about 10-20 mph the entire way and had no problems other than a couple of times having to stop and drive part way up the berm on the side of the road to make room for on coming cars to pass on their way out. 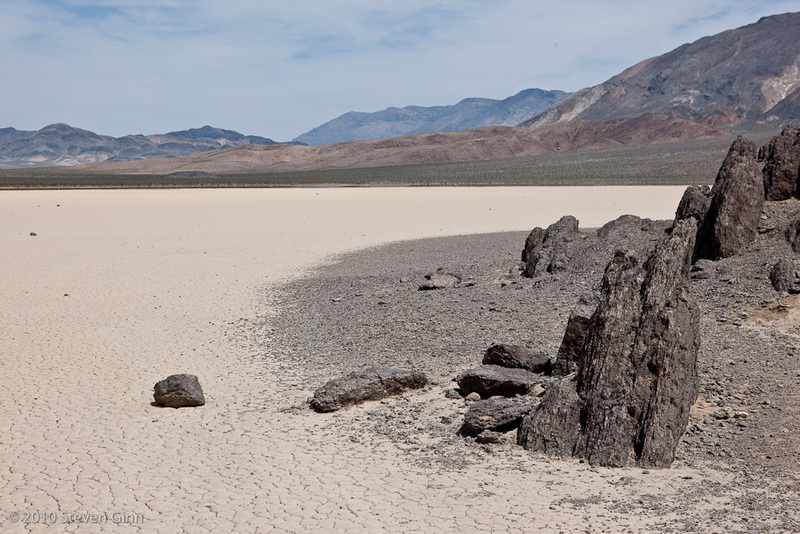 Last time I was on Death Valley I drove on a similar road with sharp looking rocks and I did get a flat, so I've learned my lesson and drive slower now. 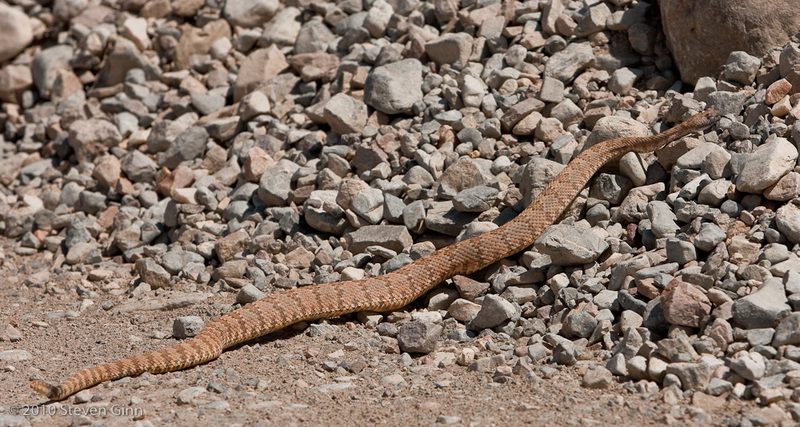 Below is a picture of some of the wildlife we encountered on this road. 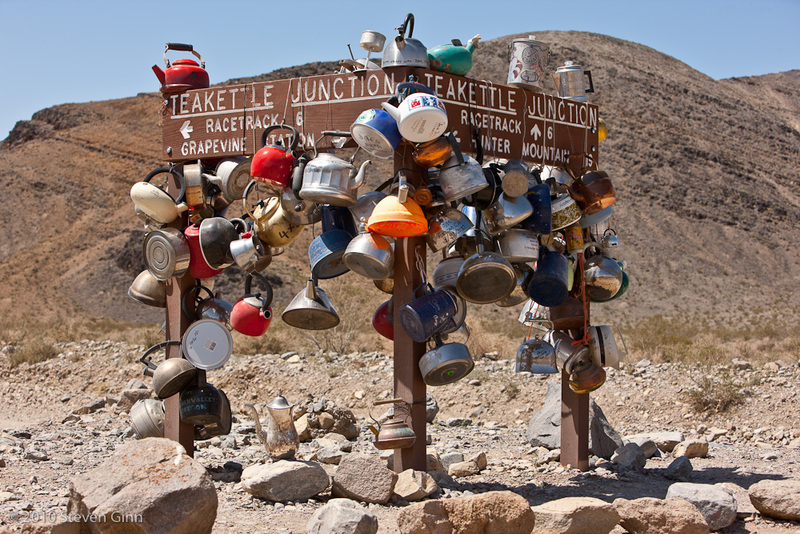 On the drive out, one famous stop is Tea Kettle Junction. We stopped here for lunch. No, we did not have any tea with lunch. 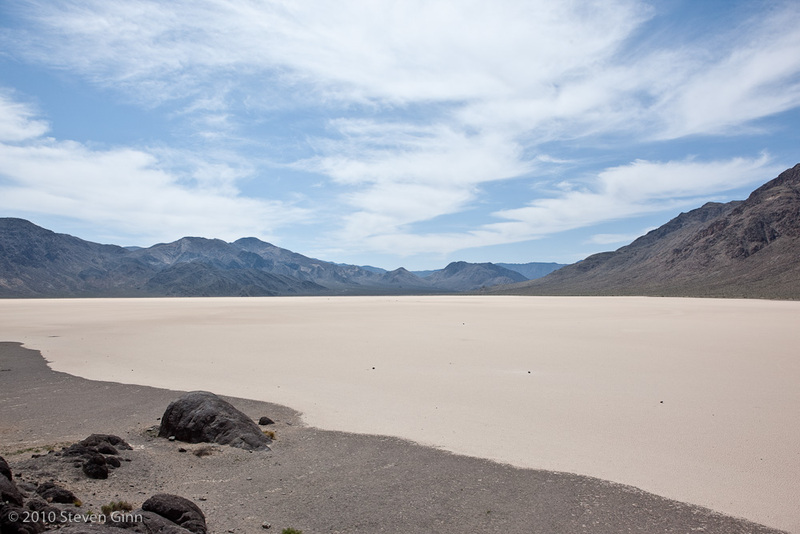 Below was our first view of the Racetrack Playa. Because we were planning on camping, we drove right past the Racetrack Playa to the Homestake Campground a couple miles south of the playa and set up camp. What does not show up well is a rather stiff wind, I parked my car as a wind block while we set up but you can probably still make out the tent leaning a bit to the right due to the wind pressure. But with the liberal use of a lot of tent stakes and leaving the rain fly off to reduce surface area the tent held up just fine. 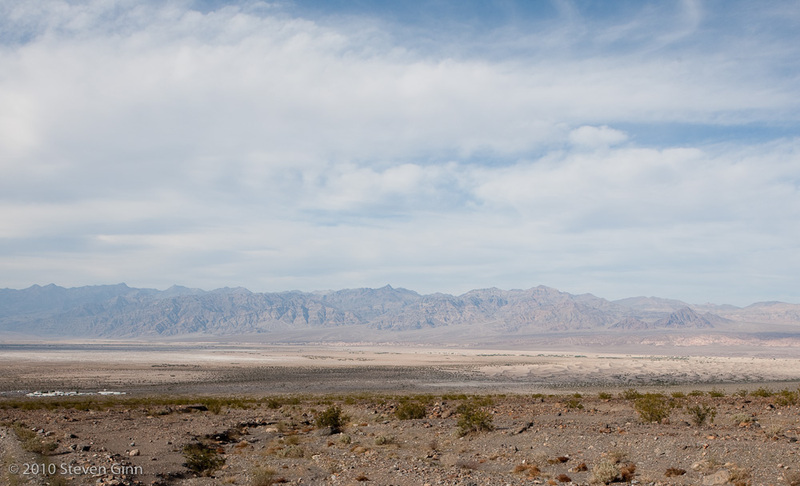 We then drove back to the Racetrack Playa and I walked out and took some shots. 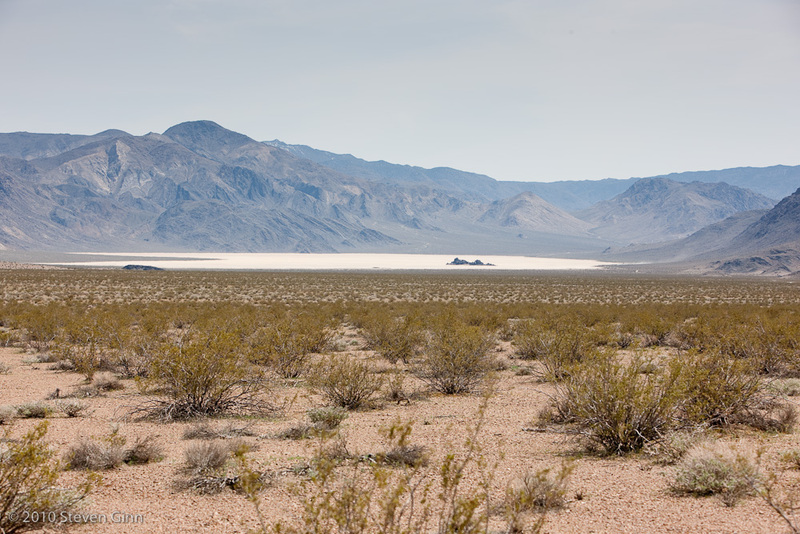 Below is one looking north towards the black rock in the middle of the playa known as the Grandstand. 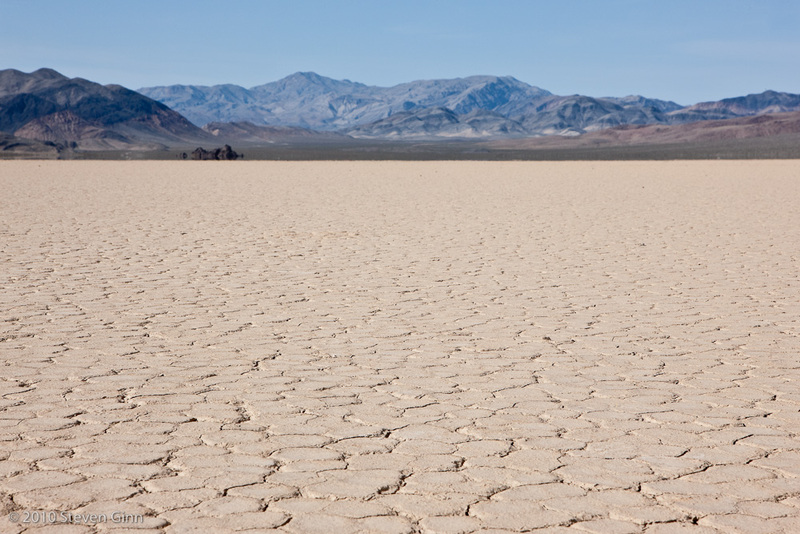 The surface of the playa is very flat and has the cool cracked mud pattern. It was firm to walk on and it was more fun than I had expected to hike on (when it's wet you are not suppose to walk on it because the foot prints can last for years). 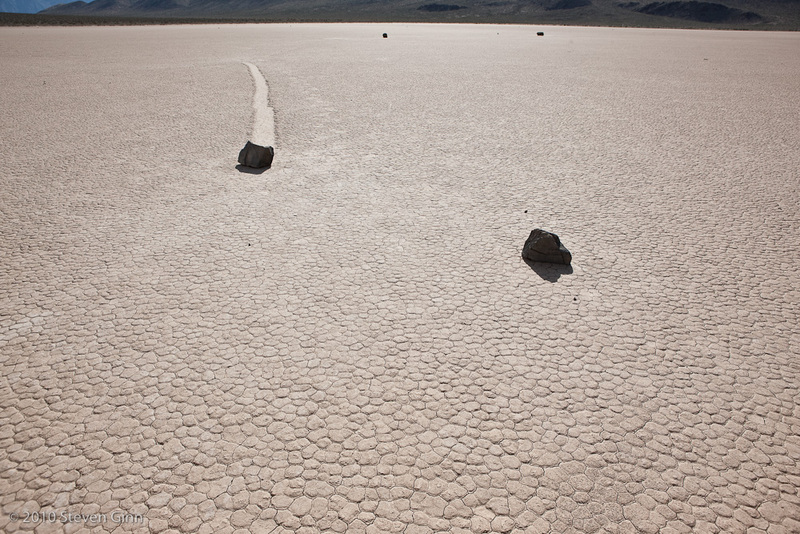 The Racetrack Playa is famous for it's moving rocks that leave paths. Nobody has ever seen one move but the theories include strong winds, very slick mud and possibly something to do with ice. I saw rocks with paths ranging in size from about a foot in diameter to dime size. The rocky hillside on the southern end of the playa seems to be the source for most of the moving rocks. Note the different directions and changing directions for some of the paths. Later, just as the sun was going down, we drove back to the playa and waited for it to get dark and then walked out onto the playa where we spent several hours taking some shots. Below is an image I took at 400 ISO with a ten minute exposure time at f/2.8. There is a lot of sensor noise in the image but I still think it looks pretty interesting. Note that you can see the rock's path in the image. We could not see this well with our own eyes, it was pretty dark. We had planned the entire trip around the one night a month when the moon would not be visible most of the night. Remember this was a 10 minute exposure so it's a little confusing what the somewhat horizontal line is in the image. Rusty was taking the same shot and he has the same line, so it's not a senor artifact of any kind. I can only assume it was a slow moving satellite. But I am not certain why it does not have a consistent curve to it's path due to the rotation of the earth during that 10 minutes. I was very interested in doing some painting with light. Below is the same rock but this time using ISO 100 and an exposure of 65 seconds at f/7.1. During the minute that it was exposing I took my trusty mini-mag flashlight and shined it on various parts of the rock and then holding it close to the ground I walked out following the rocks actual path. 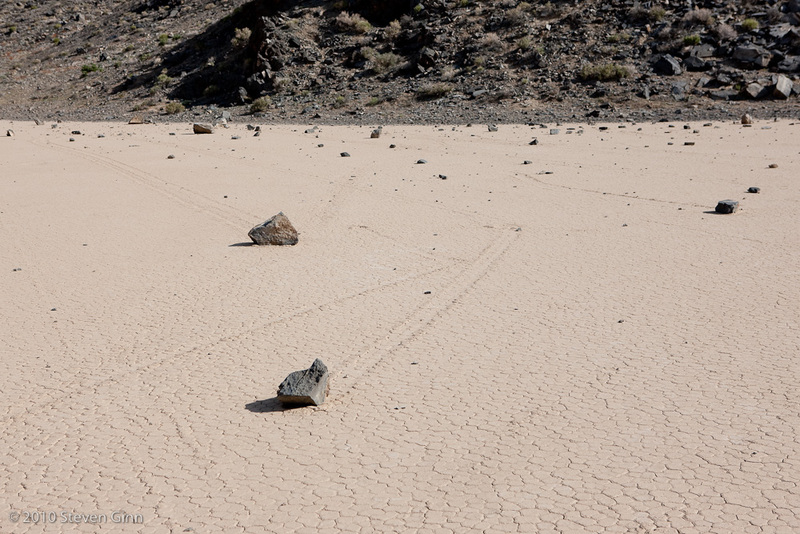 So the end result is my interpretation of the moving rocks on the Racetrack Playa which I hope is a little different than most others. The biggest problem I had, that I only resolved by trying this shot many times, was in getting a smooth path. 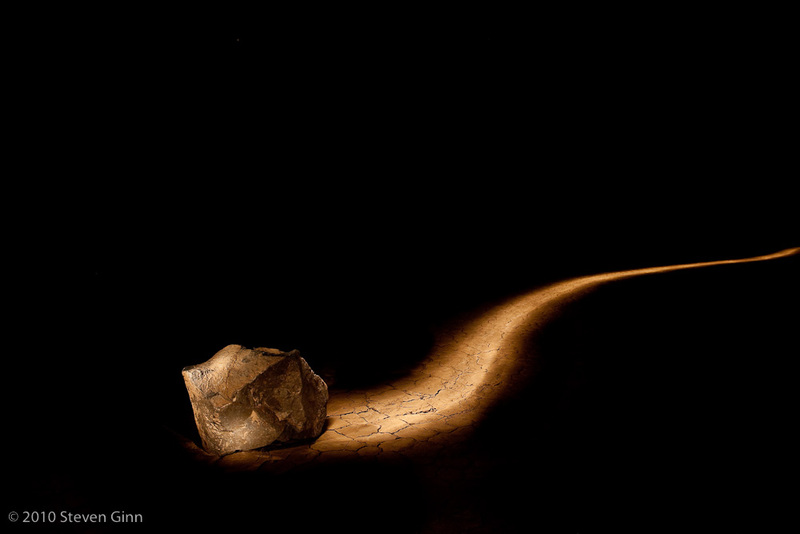 Most of the time I had a difficult time walking steady enough for the light to paint a smooth path. One bonus we had was that once night fell the wind stopped so it was not that cold and when we made it back to the tent it was nice not to listen to the wind on the tent. 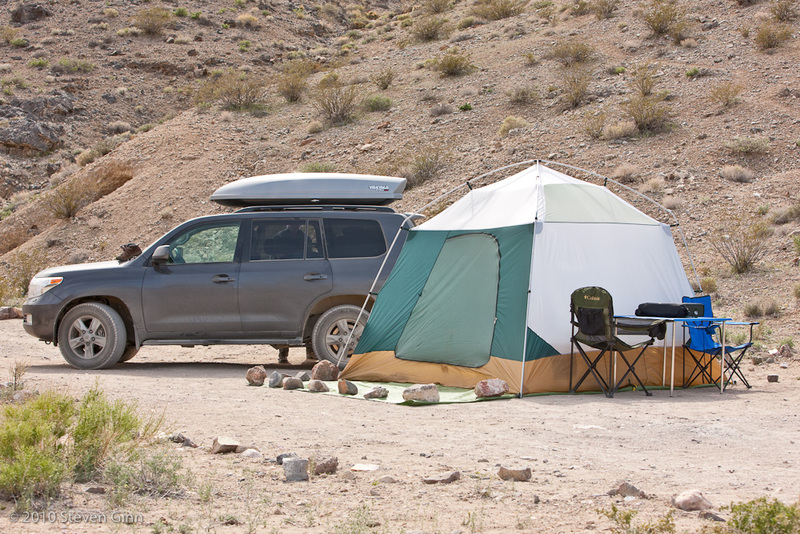 We then packed up camp and started driving out, back past the playa. We stopped at the north end and I walked out to checkout the rock known as the Grandstand, see below. I did not see any rocks with paths on this end. I did see what appeared to be an old set of tire marks headed directly to the Grandstand. You can just see it in the right side of the image below. Below is a picture I took while standing on the Grandstand looking south. I was struck by how much it felt like I was on an island with a rocky shoreline. The jutting rocks, see below, on the Grandstand are pretty interesting. 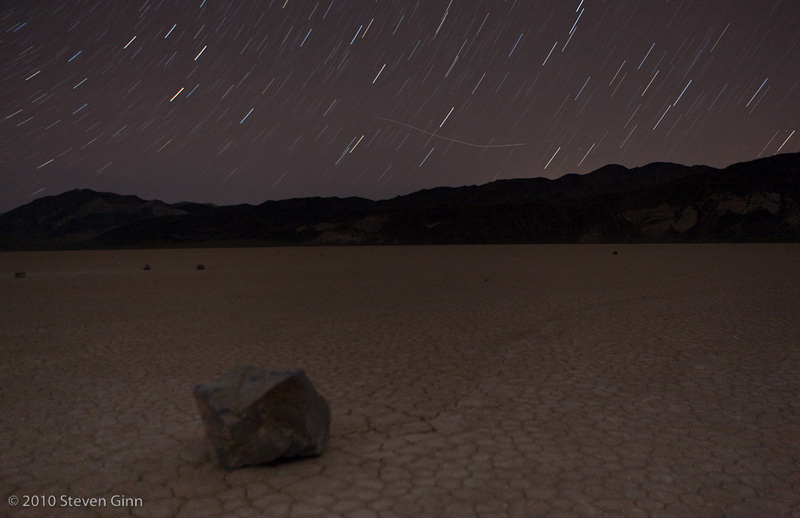 It occurs to me that next time I spend time at the Racetrack that I might try to do some night photography with light painting of these rocks. Drive out was fortunately uneventful and just before we reached pavement again there was a nice field of purple flowers on the slopes of Ubehebe Crater. This is our last night in the park and we spent it at Stovepipe Wells. Since it was still afternoon when we arrived I drove up to Mosaic canyon and hiked about a mile in. While it was a fun and interesting hike I did not get any pictures worth posting. However, on my drive back down towards Stovepipe Wells I stopped and took the picture below. The white roofs in the lower left is Stovepipe Wells and the sand dunes in the lower right are Mesquite dunes. In the end we decided that the Furnace Creek rooms and food was better than at Stovepipe Wells, but Stovepipe Wells did have the advantage that it was noticeably less expensive.